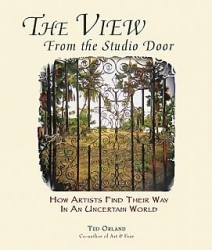 In the perennial best-seller Art & Fear, Ted Orland (with David Bayles) examined the obstacles that artists encounter each time they enter their studio and stand before a blank canvas. Now, in The View From The Studio Door, Orland turns his attention to broader issues that stand to either side of that artistic moment of truth. Simply put, this is a book of practical philosophy. As a teacher and working artist himself, Orland brings authentic insight and encouragement to all those who face the challenge of making art in an uncertain world. The breadth of material covered is reflected in chapters that include Making Sense of the World, Art & Society, The Education of the Artist, Surviving Graduation, Making Art That Matters, The Artistic Community, and more. The View From The Studio Door is the perfect companion piece to Art & Fear, and will appeal to a similar (and already-established) audience of students, working artists, teachers and professionals. For students' benefit, The View is also modestly priced, with wide page margins for easy note-taking and annotation.